Visit the Pieniny mountains in the southern Poland that create incredible rock formations. We invite you to take part in gorge-rafting. 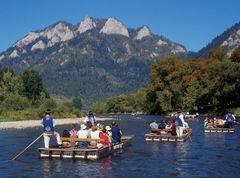 Rafting trip along the natural border between Poland and Slovakia. A 15 kilometres route will make you relaxed. It’s one of the most beautiful regions in Poland (beautiful castle in Niedzica, the Pieniny National Parka – veritable paradise). Our English speaking driver will pick you up from your accommodation. Then he will drive you to Sromowce. He will help you to buy a ticket to rafting. After rafting You can spend as much time as you wish in Szczawnica (it’s your private tour – our driver and our car exclusively for you). There is a beautiful view. Our driver will be waiting on the parking during the whole tour. After tour our driver will take you back to Krakow, to your hotel (if you wish our driver can stop for a lunch). All prices are in Euro (€) / Polish Zloty (PLN) per person. Prices as elsewhere, but the best QUALITY.